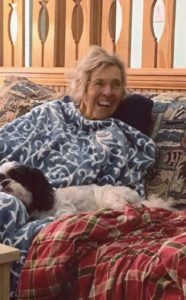 Derle Grey McCabe Moore, age 87, of Smithfield, passed away at her home on November 10, 2018. Born in Johnston County on November 11, 1930, she was the daughter of the late Charlie Emmitte and Pearl Harper McCabe. Mrs. Moore was preceded in death by husband, Horace Elvin Moore. She was a retired Accountant for the Johnston County Mental Health Department where she had served on the Board of Directors. Mrs. Moore was a longtime member of Smithfield Advent Christian Church. A memorial service will be held at 1:00 PM on Wednesday, November 14, in the chapel of Parrish Funeral Home in Selma with Rev. Steve Spearing officiating. The family will receive friends immediately following the service. Surviving are her son, Horace Elvin Moore, Jr. and wife Julianna of Elm City; grandson, Daniel Bryan Moore of Raleigh; and her brother, Carl McCabe of Smithfield. Memorial contributions may be made to Smithfield Advent Christian Church, 2777 NC Hwy 210, Smithfield, NC 27577.